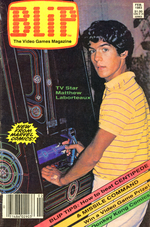 Blip is a short lived gaming magazine released by Marvel in 1983. The magazine was aimed at a young audience and contained articles, strategy guides, and comics, among other features. The first issue featured a comic based on Donkey Kong. The story begins with news reporter Vic Video interviewing Mario. Vic quickly proves to be rude and inconsiderate, not allowing Mario to get a word in edge-wise and continuing to bother him even when Donkey Kong suddenly appears. Donkey Kong has kidnapped a damsel who resembles Lady, although Mario claims that he does not know her. After she is rescued, Donkey Kong kidnaps Vic, who attempts to interview him only to be thrown off the construction site. Mario rescues him just as Donkey Kong captures the damsel again, and Mario and Vic chase him, while Mario reveals some backstory: Donkey Kong was genetically engineered in Japan to help with construction work, but instead he chose to kidnap damsels, which is how he and Mario first met. Mario explains that the reason he kidnaps damsels is that "they remind him of the mother he never knew", and he fights Donkey Kong only because he feels he is the only one able to do so. As they reach Donkey Kong and the damsel one last time, Mario tells the damsel to scratch Donkey Kong behind the ears, which soon pacifies him. As the three begin to relax, Vic asks Mario how they plan on getting down from the construction site, in response to which Mario simply asks: "Down?" This page was last edited on November 20, 2018, at 22:59.